The constellation of Auriga contains some beautiful expanses of emission nebulae. As shown in the annotated version, this widefield image shows several of these nebulae. The Tadpoles (IC 410 aka Sh2-236) is the red Ha and bluish OIII region towards the middle bottom of the image. Contained within IC 410 is the newly formed star cluster NGC 1893 along with the Tadpoles - an artifact generated from the stellar winds coming off the cluster. 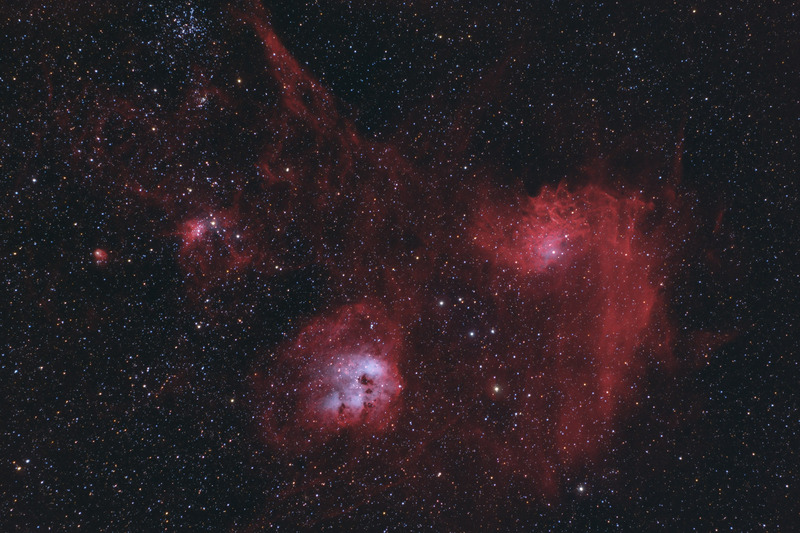 Towards the upper left of the image is the Spider (IC 417 aka Sh2-234) and the diminutive Fly (Sh2-237). The Fly surrounds the open cluster NGC 1931. Directly above the Spider are two more open clusters - NGC 1907 and the much larger and richer M38. (NGC 1912). The Flaming Star nebula (IC 405/Sh2-229 - upper right in this image) is illuminated by the bright star at its center, AE Aurigae. In this image, North is up. This image is cropped to 83% of the original full frame. Software Used Images Plus 5.75 for camera control, calibration, and stacking. Images Plus 6.5 for arcsinh stretching, feature mask, star size and halo reduction, smoothing and noise reduction, color channel splitting and recombination, feature mask, edge mask extraction, and masked stretching. Photoshop CS5 used for levels and curves, high pass filter, screen mask invert, lab color, saturation adjustments, selective color, match color and unsharp mask. Gradient Xterminator for gradient removal. Carboni Tools for additional noise reduction and smoothing. HLVG for additional color correction. Registar for stack alignment and registration. Pixinsight 1.8 for star mask generation, plate solving, and image annotation. Notes It took me two years to get around to processing this image, but I'm glad I finally did. I found the variety of objects in this image to make for a fascinating field of view.